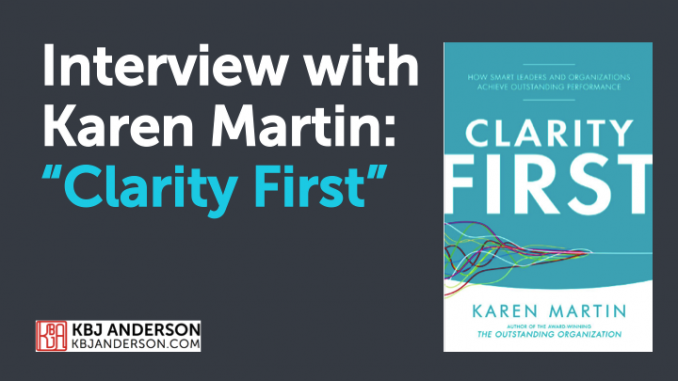 I was thrilled to receive my copy of Karen Martin’s new book “Clarity First” in the mail a few weeks ago, and I’m even more thrilled to be able to share with you a recent dialogue Karen and I had recently about the book. 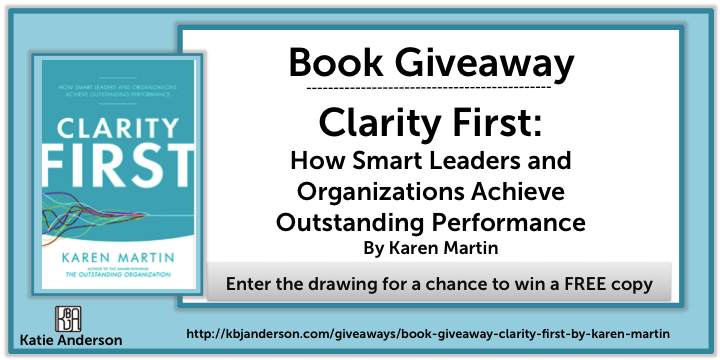 Congratulations to three lucky blog readers who won their own free copy of Karen’s book “Clarity First” in the giveaway. Even if you missed this giveaway, you can buy your own copy of Clarity First on Amazon or at your favorite bookstore. Don’t miss out reading on this important book. Start taking steps to gain more clarity in your life and in your organization. Karen and I first met three and a half years ago at the Lean Coaching Summit in Long Beach – the same conference at which I met Isao Yoshino and shortly after learning that my family and I would be moving to Tokyo. 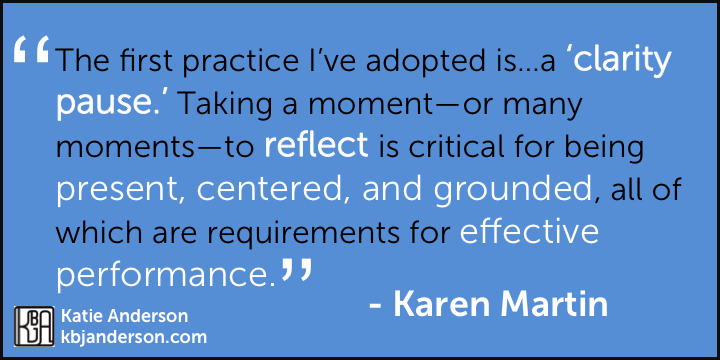 I’ve been a fan of Karen’s since then and enjoy exchanging thoughts about leadership, Lean, and coaching practices. 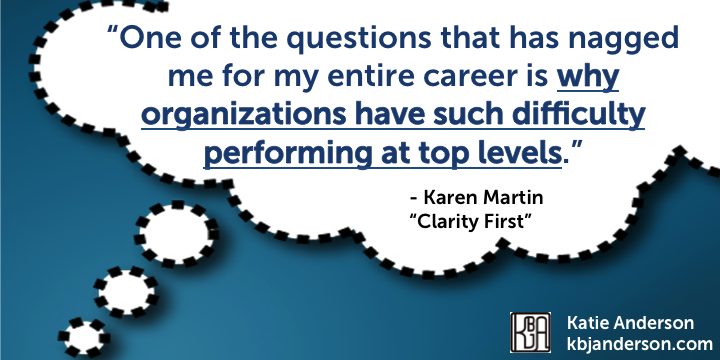 In “Clarity First”, Karen convincingly lays out the reasons why lack of clarity drive waste in our organizations – and personal lives – and puts forward tangible and actionable countermeasures that we can take at individual and organizational levels to eliminate ambiguity and become more effective at achieving our goals. Throughout reading “Clarity First”, I was struck by two things. 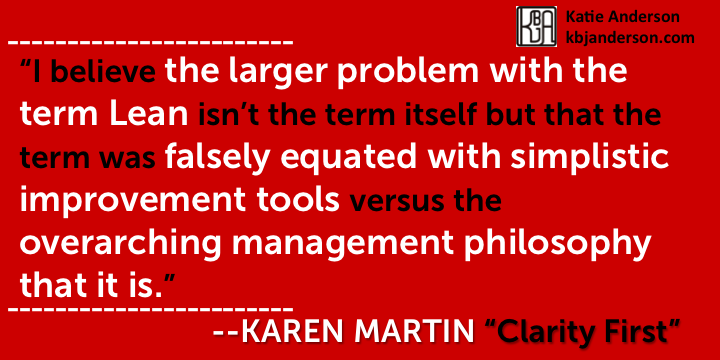 First, how much the systems and practices of “Lean” are countermeasures for lack of clarity in our organizations, and second, how Karen is able to explain these “Lean” practices without using much of the “lingo” of Lean. Do our words impact clarity? Sometimes I worry that we as Lean practitioners have created more complexity or barriers to using the principles by focusing on a practice as being “Lean” by calling it by a Japanese name or someone putting up a barrier because they have a bad impression of what “Lean” is. To me, Lean thinking and practice are just better management systems, practices and ways of thinking. Karen’s book is the best book out there about “Lean” that I’ve read recently that describes the essence of Lean management practices without being explicitly a “Lean” book. Without further ado, please read on to read my interview with Karen. I’m honored that she – a great questioner in her own right – told me that these eight questions were the best that she’d been asked! I’ll leave that for you to judge. 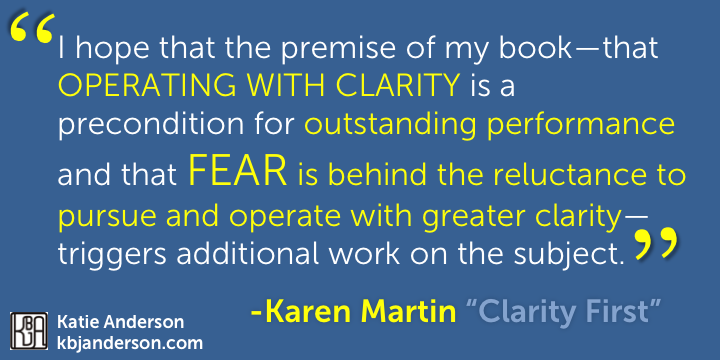 Read on about what Karen Martin has to say about clarity, personal practice, and Lean thinking. Good question! Many things were keeping (and continue to keep me) up at night. One of the questions that has nagged me for my entire career is why organizations have such difficulty performing at top levels. It’s so easy for those of us in business performance improvement to see the problems that get in an organizations’ way. Why can’t they see them? And, once they see them, why aren’t they more effective in closing the gaps? Is the reason as simple as a skill gap? Or is it due to something far deeper that’s laced in human nature and psychology? I believe we have a long way to go, for example, in understanding the role that fear plays in organizational performance. 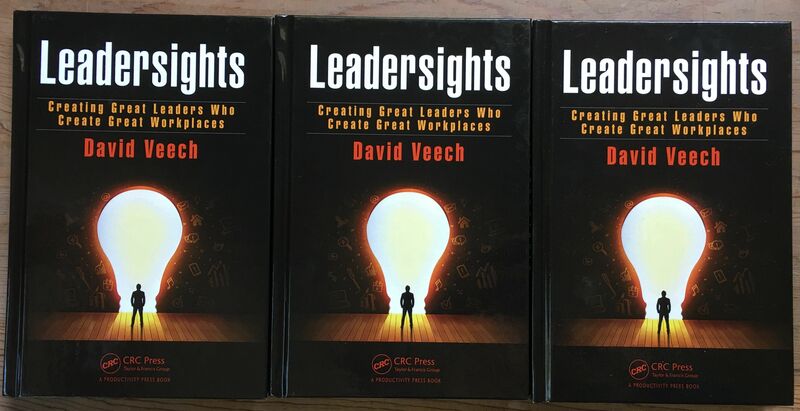 I hope that the premise of my book—that operating with clarity is a precondition for outstanding performance and that fear is behind the reluctance to pursue and operate with greater clarity—triggers additional work on the subject. 2. In your experience, what is the biggest challenge or barrier you have observed that inhibits organizational clarity? Fear takes the #1 spot. But I do think skill plays a significant role as well. Even after we help teams move past fear and grow comfortable displayed KPIs on a wall for the whole world to see, they often struggle to select the best KPIs for effectively managing the work. 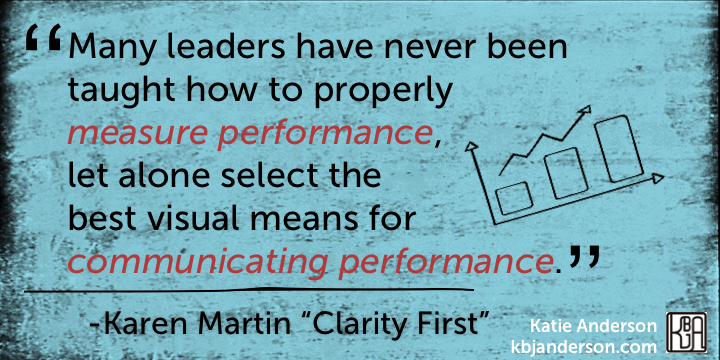 Many leaders have never been taught how to properly measure performance, let alone select the best visual means for communicating performance. 3. In the chapter titled “You”, you state that “organizational clarity begins with you”. What is one thing that readers can start doing more of today that will lead to greater clarity in their organizations? Everyone needs to become a champion of clarity by talking about why it matters, being persistent in seeking it, and then committing to delivering it. 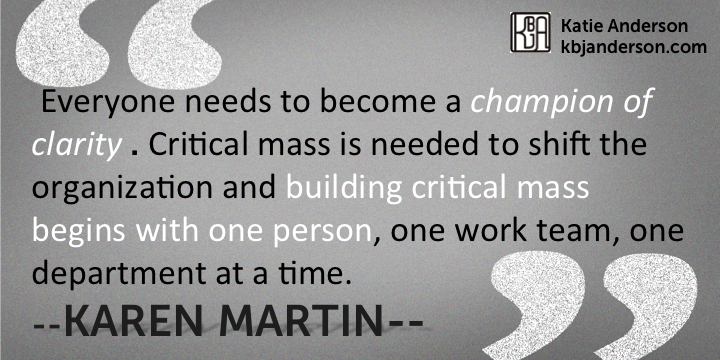 Critical mass is needed to shift the organization and building critical mass begins with one person, one work team, one department at a time. On a more practical level, commit to operating with greater humility and curiosity by adopting an “I-don’t-know-but-I-want-to-learn” mindset. Commit to never starting to solve a problem until you know what the problem truly is and never trying to solve a problem until you understand the root cause(s) for it. To build this type of “clarity muscle,” increase the number of times you ask why each day. 4. What has been the most helpful practice for you to personally gain more clarity in your own work or day-to-day life? I’ve adopted two practices that have proven helpful. The first is what I refer to in Clarity First as a “clarity pause.” Taking a moment—or many moments—to reflect is critical for being present, centered, and grounded, all of which are requirements for effective performance. It’s especially transformative when you get enough practice with this that you can map your thought processes. I’m not conscious of my clarity pauses any longer because they’ve become habituated into how I think and behave. For me it started with meditation and yoga. Others may simply want to sit at their desk for a few moments and simply breathe. Breath is our most powerful asset as living beings. The second practice I’ve adopted is asking questions about questions, and wow is this powerful! It all started one day when a client asked me a question and I sensed there was a lot behind the question that he wasn’t articulating. I said, “I’m curious to learn why you’re asking that question.” He proceeded to unload a ton of baggage that was critical for me to understand. If I hadn’t asked the question about the question and learned what he was really asking, I would have given an improper response. 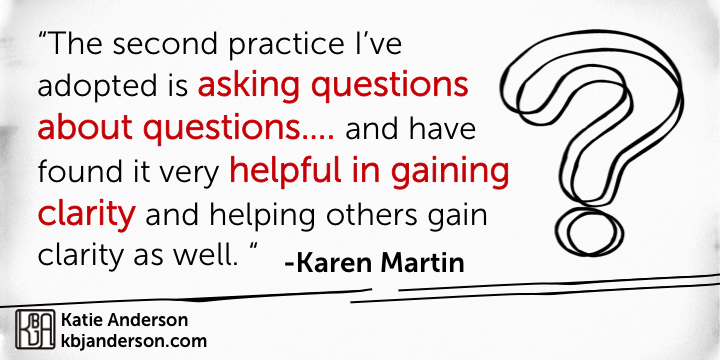 After that, I began asking questions about questions a lot and have found it very helpful in gaining clarity and helping others gain clarity as well. 5. What is one thing that you got clearer about through the process of writing the book? Why clarity scares people. I’m still actively exploring how best to mitigate that fear when I’m not part of the organization, not onsite on a daily basis, and am not in a role where I can directly influence daily operations. 6. 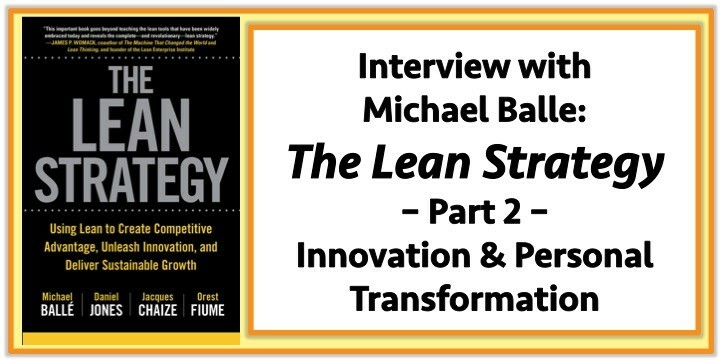 How do you think Lean terminology and or even the term “Lean” has impacted clarity of understanding what Lean actually is all about by those who are not already Lean practitioners? I sense that many Lean practitioners have moved beyond the original heavy use of Japanese terms. I don’t hear as much of that anymore. That said, I have had a few clients where using Japanese terms was part of the initial “hook” to Lean being something different—and more effective—than other methodologies they had attempted. They liked using Japanese terms and I have a “whatever works” attitude when working with clients. Strategy deployment is a methodology that I believe actually suffers from use of the English term. 100% of the leaders we work with say they “do” strategy deployment. After all, they have a strategy (or something that approximates a strategy) and they take some sort of action, which smells like deployment. But most of what organizations do doesn’t even come close to strategy deployment in the Hoshin Kanri sense. I could write pages about what I think about the term “Lean.” Labels are a wonderful tool for efficient communication. But efficiency comes at a cost for complex concepts like Lean management. 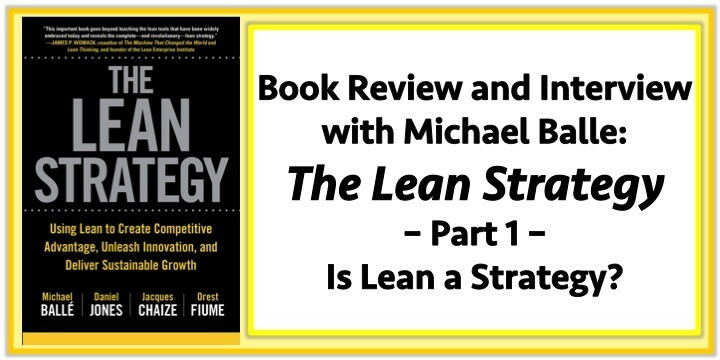 I believe the larger problem with the term Lean isn’t the term itself but that the term was falsely equated with simplistic improvement tools versus the overarching management philosophy that it is. We’re turning the cruise ship around now, but it still takes a lot of effort to help leaders—and improvement professionals—understand what Lean is and what it is not. Hmmm… that’s a good one. I’m relieved that no one has asked “what’s next?” yet. I’m not sure there’s going to be a next book for me. Clarity First is #5 and it was a difficult book to write. Plus, there’s so much to unpack regarding clarity and its role in successful Lean management. I think that may keep us all busy for a very long time. I’m also relieved no one has asked how to bring clarity to Washington, D.C. I can’t even begin to answer that question! 8. What are you currently pondering about clarity and leadership? How best to help leaders become more self-aware about how their mindsets and behaviors move the organization needle toward clarity or toward ambiguity. And, related, I spend a great deal of time thinking about how best to influence leaders to shift their mindsets and behaviors for the benefit of the organization. Every thought, word, and action matters. Clarity is a gift every leader can give or take away. Next week I am going to be speaking at the Lean Transformation Summit during the “Lean Talks” – a TEDTalk-like series in which I’m giving a talk on “Getting out of the habit of telling”. 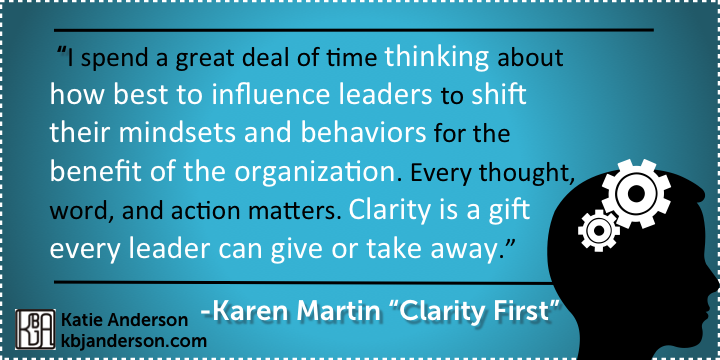 I plan on using Karen’s description of a “Clarity Pause” as it is a fantastic description for an action that I have been personally doing for years – and coach others to do – when taking steps in changing habits and improving leadership behaviors. I love the term “Clarity Pause”. Early in the “Clarity First”, Karen states that “profit is not your purpose” (p. 43). This comment reminded me of the book “Tree Ring Management” written by a Japanese businessman whom many Japanese Toyota leaders consider their sensei. He declared that “profit is like excrement produced from a healthily body” or in other words, the outcome if the process is healthy. You can check out the blog post I wrote about it a few years back: “Tree Ring Management: Take the Long View”. Don’t forget to register to win your own free copy of “Clarity First”. Click here to register for the giveaway. If you want the book as soon as possible, you can also buy your own copy of Clarity First on Amazon or at your favorite bookstore.